To improve the education possibilities of children who need help. The Toonpanya Foundation is a charitable foundation based in Chiang Mai, Thailand. We provide equipment and education to those who need it most. Know someone who needs our support, or maybe you want to help? The Toonpanya Foundation recieved a request from a school, which can only be accessed by boat. They did not have mains power, and so power was supplied through solar energy. 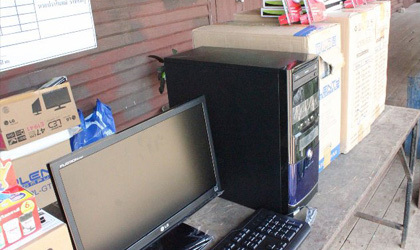 The school only had one computer which had broken, and they wrote to the foundation to request computing equipment. "I really enjoy my English lessons. The staff are very friendly and helpful. I hope to use what I have learnt to study abroad."